This unique product is made entirely from natural ingredients. It comes in several colours to match various occasions and skin tones.5 shades to choose from. Autumn Wheat with Calendula - Perfect for mature skin & for a summer sunkissed look. Ginko Green with Aloe - Ideal for slightly reddish face complexion and for masking-over tiny surface capillaries. Apply Ginkgo Green powder to your face and your skin will look light, smooth and rich of natural lustre. This powder tone can cover minor skin blemishes, acne and dark skin spots. What could be more exotic or natural than adding these beautiful ingredients to your makeup routine. These unique products are made entirely from natural ingredients and come in several colours to match various occasions and skin tones. Pearl Silk Powder's gentle colours and subtle natural fragrances are from real flower buds processed in a proprietary process, which preserves the buds's natural fragrances and colours. 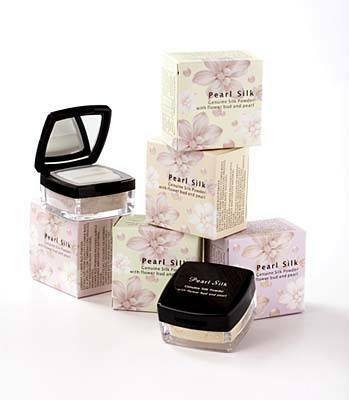 Sea pearl powder content in Pearl Silk Powder provides certain level of cover, while the real silk powder diffuses light, giving your skin a soft, sheer and unbelievably natural look. When using Golden Silk Oil and Pearl Silk Powder as your daily make-up combination, you do not need to use chemical make-up removers and deep cleansers. Pearl Silk powder is easy to wash away with warm water making it easy to maintain optimum sebum balance. Ingredients: Natural Silk Powder,Pearl Powder,Flower Bud Powder. Ground sea pearls contain 7 amino acids, Vitamin B and essential elements which are highly effective for the health of your skin. Silk Powder contains 18 amino acids helping your skin to retain moisture whilst it breathes. Flower Bud Powder provides a subtle aroma and gentle, natural colour. No Talcum. No Titanium, Kaolin or other minerals.